This year, I wanted a simple Thanksgiving. We had my parents and in-laws over and my son's girlfriend. So for a small group of 9 people, I opted to cook a turkey breast...or two. I have cooked turkeys in the past and the white meat goes first. Its almost a race to get them! Also, it is difficult to keep the white meat moist. 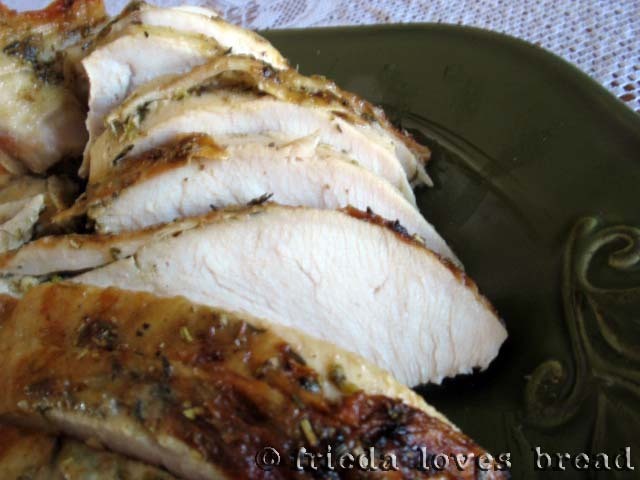 We have tried brining, injecting, and smoking turkey breasts, with mixed results. My husband would love to smoke all his meats. Brining (soaking meat in salt water) does make it moist, but sometimes it has been too salty. Reading somewhere, I found out that you are supposed to rinse the meat after brining. Injecting has brought some saltiness, too. Besides, I think turkey breasts are already injected. With what, I don't know. It is a good idea to have a meat thermometer or a probe (if your oven comes with one, like mine does). I cooked two almost 6 pound turkeys and it took about 2 1/2 hours. Longer than this recipe indicated. My good friend from Comemos-Let's Eat showed me a book from the Barefoot Contessa. She loved her simple cooking. I Googled her and came across her recipe for Herb Roasted Turkey. It turned out sooooo good. And soooo easy! My dad commented that he would like to do his turkey with all white meat again...I'll take that as a compliment! Preheat the oven to 325 degrees. Place the turkey breast, skin side up, on a rack in a roasting pan. In a small bowl, combine the garlic, mustard, herbs, salt, pepper, olive oil, and lemon juice to make a paste. (it was runny, but worked just fine) Loosen the skin from the meat gently with your fingers and smear half the paste directly on the meat. (A small spoon worked better than using my fingers) Spread the remaining paste evenly on the skin. Pour the wine into the bottom of the roasting pan. Roast turkey for 1 3/4 to 2 hours, until the skin is golden brown and an instant-read thermometer registers 165 degrees when inserted into the thickest and meatiest areas of the breast. Test in several places. If the skin is over browning, cover the breast loosely with aluminum foil. When the turkey is done, cover with foil and allow it to rest at room temperature for 15 minutes. Slice and serve with pan juices spooned over the turkey.